You can reveal this card in your hand; your opponent randomly chooses 1 card from your entire hand, then you discard the chosen card. Then, if the discarded card was not “Danger! Bigfoot!”, Special Summon 1 “Danger! Bigfoot!” from your hand, and if you do, draw 1 card. If this card is discarded: You can target 1 face-up card your opponent controls; destroy it. You can only use this effect of “Danger! Bigfoot!” once per turn. Danger! 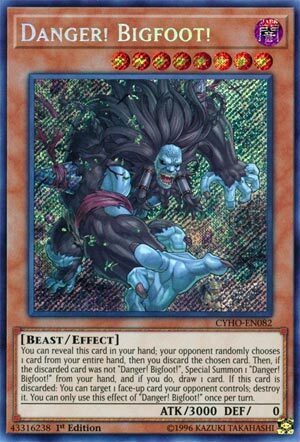 Bigfoot is a Level 8 Dark Beast-type monster with 3000 Atk and 0 Def. He’s also not showing those big feet. He does the Danger! thing that makes your opponent chose a card of yours at random to gain an effect. Discarding a Bigfoot means you get to destroy a targeted face-up card of your opponent’s. If they miss you get to Special Summon a big beat stick and draw a card. Not bad options. Also, Level 8 means Trade-In works here. Not much else to say. Danger! Bigfoot! should have feet in the foreground and more hair and more defense. I mean it’s been years since he was spotted last, that should be reflected in the Def. Anyway, there are only 2 more cards in the whole archetype so definitely run three of Bigfoot even if you only need 2. (get it? 2 feet…hehehehehe) Happy Friday! We end this week off with the biggest of the Danger! monsters, Danger! Bigfoot! Bigfoot! is a Level 8 DARK Beast with 3000 ATK and 0 DEF. ATK is great, but DEF is poor. Level 8 means Trade-In and Bigfoot! likes being discarded, DARK is a great attribute, but Beast doesn’t offer much on a Level 8. Bigfoot! has the Danger! effect like the other Danger! monsters so far and I imagine it’ll be on future Danger! monsters. When Bigfoot! is discarded, you can target and destroy a face-up card your opponent controls. Any form of removal is great, though Bigfoot! will not be live first turn if you discard it, though with the 5 cards in your hand you’ll have an 80% chance of summoning it. Danger! loves going second and this proves why, Danger! so far wants to hit your opponent hard and discarding this first turn is not that great. Future support might allow this deck to go first, but Danger! Bigfoot! will always be worthy of playing in the deck at multiples for being great removal and having good ATK. Art: 4/5 I expected Bigfoot to be more hairy, to be honest, but I guess it is better that he isn’t. Danger! Bigfoot! closes the week (maybe we’ll get to cover the two Monsters I couldn’t fit in this week, next week, I’m not sure, but soon) Beast, Level 8, a brutly 3000 attack but an equally big, glaring 0 defense. Guess Bigfoot! is all attack but can’t do anything to protect himself. So, as is the theme, you can reveal this card in your Hand for your opponent to pick one at random, and the card is discarded if it isn’t Bigfoot! but if the card chosen/discarded isn’t Bigfoot! he is Special Summoned from your Hand to the Field. A 3000 attack Special Summon is never a bad thing folks. Like we saw with our Jackalope friend, if you succeed in this Special Summon, you also get to Draw a card. What’s better than a 3000 attack Special Summon? Said Monster and a new card from your Deck. If this car is discarded, (instead of a Special Summon like we saw earlier this week) you get target and destroy a card of your opponent’s, so long as it’s face up. Bigfoot! is definitely the heavy hitter of the Deck, and as I know I’ve referenced, I hope this card pool, at least in Monster form, grows sooner than later. This should be a great Deck to play around with in the now. Strong, Dark, can destroy as well, the only true downside is total lack of defense. Art: 5/5 Bigfoot, while fairly intimidating in this picture, looks more alien like than Beast like with that blue skin. But it’s still a nice picture.